Sara Crosby and Beau Burdette are the hard working team behind this new brand. After Beau helped to build the home fragrance brand, Rewined, he took this knowledge and paired it with his love for locally grown food and organic farming. 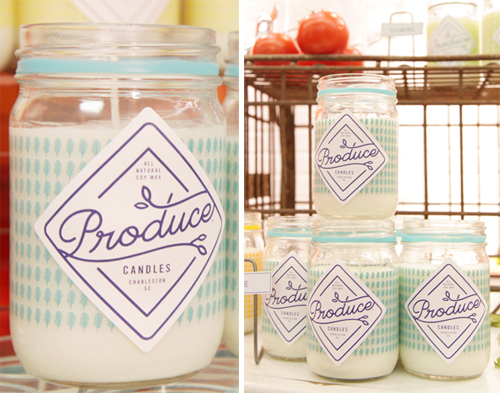 Produce Candles was founded upon strong ideals and deep passion...and it shows. Sara is working close with Beau on the entire project from the everyday production to marketing and branding. Their amazing booth at AmericasMart certainly stood out amongst the fray. I especially loved the white brick facade, vintage bike and mini colander pendants. 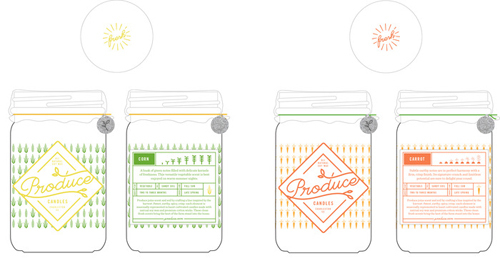 All of the Produce Candle scents are inspired by local farms, which Beau and Sarah visited countless times. Sarah, "When dealing with fruits and veggies, it's much easier to fall into an artificial fragrance pattern so we did a lot of back and forth tweaking. We really wanted to be as raw and organic as possible." They also wanted to promote and celebrate that Slow Food mentality of connecting with local growers, buying seasonally and truly experiencing the freshness and beauty of produce. They've created their base candles which will be available year round. These include Carrot, Honey, Kale, Melon, Peanut, Radish and Wildflower. Others will be added seasonally- like this spring you'll also find Rhubarb, Snap Pea and Cilantro and in the summer look for Tomato, Corn and Peach (above). I have to say, my personal favorite is Radish. I've always wanted to name my dog Radish- I love the name, I love the color, their fresh, crispy taste and of course, the smell. I took one of these candles home and its been burning in my kitchen ever since. I'm a fan, to say the least, and excited to try more. Sara's favorite was Rhubarb, then it was Honey, now it's Cilantro. As she shared, "I have found myself just holding the Cilantro in front of my nose." They're really addictive. The incredibly talented Stitch Design Co. in Charleston designed all of their labels which are vibrant, charming and dare I say, adorable. They quickly do their job in making you want to pick one up and see what they're all about. **You can pre-order candles now on their site & they'll be ready to ship directly on February 24th.